From time to time, I'll stop by here with a short message to let you know how the next episode of the podcast is progressing, or if there's a new or interesting development in the field of psychedelic-assisted mental health therapy. Kalk Bay Books is an independent book store down on the South Peninsula, about half an hour’s drive from Cape Town. They regularly invite authors in to talk about their latest book projects. The Psychonauts podcast isn’t a book, bound between two covers, but it is, essentially, a serialised audio-book, which I’m releasing chapter by chapter as the project unfolds. Last month this book store hosted an evening of discussion about the topic of the potential to mainstream psychedelic-assisted therapy here in South Africa. The event was sold out. In fact, there was so much interest, that we decided to hold a second event this week. Dr Rene Usdin, a practising integrative medical doctor from Hout Bay, agreed to sit in discussion with me on both evenings. So here it is, a recording of the second evening’s discussion. A brief update of the state of the legal case that was due to start in 2018, where the legal team representing Monica Cromhout (hear her story in Episode 2: The 'Drug Den') planned to make a case before the Western Cape High Court to decriminalise psilocybin. The voice note also considers two other possible legal routes that could see psilocybin decriminalised or legalised here in South Africa. This would pave the way for mainstreaming of psilocybin-assisted therapy in the medical community. Psychedelic medicine is likely to become legal and mainstream in some parts of the world in less than a decade. One form is already legal and being practised here in South Africa. But until all forms are legal, many South Africans will continue to seek out this medicine in the underground community. In the interests of harm reduction, this Voice Diary looks at how to put a responsible medical support structure in place for those who are going to try this medicine regardless of its illegal status. It also considers how the medical community can start gearing itself up for when the medicine becomes legal. Ibogaine, the potent psychedelic from west-Central Africa, opens the door for psychedelic-assisted therapy in South Africa, and sets a precedent for how psilocybin should be regulated here if the courts decide to make it legal for medical use. 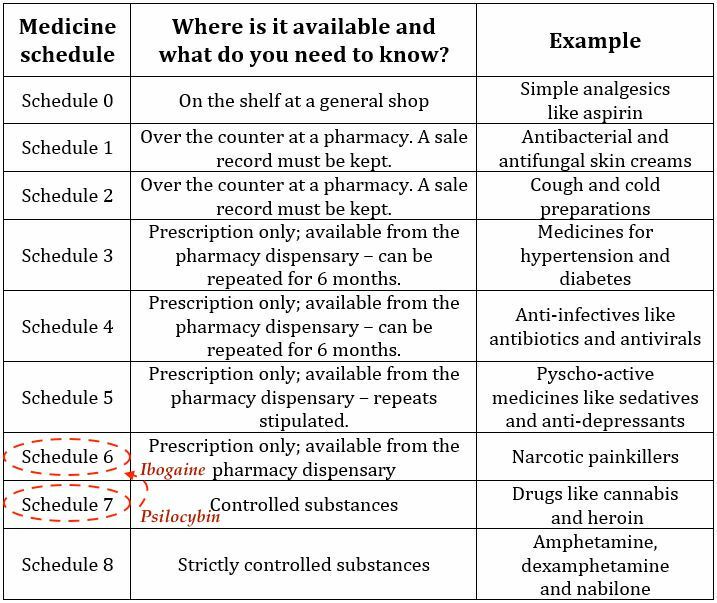 A quick guide to the Medicines Control Council of South Africa' scheduling for medicines. Drug scheduling in South Africa: psilocybin, the hallucinogenic compound found in magic mushrooms, is listed as a Schedule 7 substance, meaning it is an illegal drug, like heroin. Ibogaine is a Schedule 6, meaning doctors can prescribe it for medical use. The audio of a PechaKucha talk which Leonie gave on 7 November in Cape Town. You can see the film version on the YouTube channel. A summary of how psilocybin-assisted therapy could be introduced into the public mental health system in South Africa, should psilocybin be legalised or decriminalised here. Introducing the idea of the occasional Voice Diaries, to let people know what's happening behind the scenes, and when to expect future episodes.